This article considers the (re)production of Hong Kong’s urban space in cyberpunk cinema, specifically in the American interpretation (2017) of Mamoru Oshii’s Ghost in the Shell (1995). How Chinatowns and Asian cities have inspired cyberpunk environments in both literature (e.g. Neuromancer 1984, Snow Crash 1992) and film (e.g. Blade Runner 1982, Ghost in the Shell 1995) has been extensively explored (e.g. Bruno 1987, Doel and Clarke 1997, Wong 2004). Asian urbanities have fed imaginations about density, verticality, and alienation. Wong (2004, 100) argues that, as filmic configurations of urban futures, Asian cities can be seen as prototypes of what capitalist world cities might become (King 1990 in Wong 2004, 100). Davis (2010, 140) points out, however, that while these cinematic cities signal certain Asian mobility, imaginaries of high-tech futures in the cyberpunk genre particularly emphasise the dark side of life, presenting grubby alleyways, shady business, and images the like. From William Gibson’s Neuromancer (1984) to Guillermo del Toro’s Pacific Rim (2013), rampant hypermodernity has been presented in a dystopian fashion that involves not only stories about the dark sides of life but also visual narratives about neon-lit and significantly vertical façades. This article considers urban Hong Kong, in these narratives, to be both an actor and a shell—not much different from Ghost in the Shell’s Major character and her cybernetic body. In film, the city is not represented but reframed as “a body with a ghost”: in cyberpunk film specifically, it is reframed as a shell patched with lights and shadows, encapsulating the soul (or what is left of it) of a place. The cyberpunk city is not a copy of a “real” city but rather a particular rendering of a city that is already a simulation. James Tweedie (2010) stated with reference to Seijun Suzuki’s Tokyo Drifter (1966) that “[t]he neon sign is where the city begins to assume the form of cinema”. Although he subsequently argues that, today, neon in the “city of spectacle” is rather a fragment from another time and “the future of the city is no longer written in neon” (Tweedie 2010), the dystopian city of the future is significantly and persistently neon-lit. The dystopian city of the future is a patchwork of recycled images—a pastiche, as Bruno (1989) argues. Taking on the position that the cinematic city is not just a context or an image, but also a body and a ghost, this article articulates how, via Oshii’s visual elaborations in the 1995 anime, the American adaptation has produced another kind of future city; a future city that finds both resemblance and misconception in the everyday experience of Hong Kong as a “shell” that is both familiar and unfamiliar (Abbas 1997). This article, thus, reiterates the exchange between film and the city towards a story about spectacle and contemporary urban experience. The digital revolution that coincided with (and accelerated) the rise of Asia and the growth of Asian megacities, provided the science fiction genre – specifically its sub-genre cyberpunk – much inspiration. Since its early development, cyberpunk (novels, comics, and films) has adapted and built upon the aesthetics of, and imaginations about, digital technology, Asian urbanity, and their convergence. Whether set in Chinatown-like impressions of Western metropolises, in non-specified places of transit, or in actual Asian cities of the near future, the cyberpunk genre with its distinctive visuality has taken Asian urban space as its defining image. This article focuses on the representation of the Asian urban landscape in the context of science fiction – of cyberpunk to be more exact. It addresses the visual specificities of the imaginations, “reimaginings”, and interpretations of urban space in the American adaptation of Ghost in the Shell (2017). The film being uniquely intertextual, it ought to be understood in the context of the cyberpunk genre (or sub-genre) as a whole. We therefore first elaborate an inquiry into the development of the genre as it configured differently in the West and in Japan. In this inquiry, we acknowledge its socio-historical context while considering its engagement with Asian urban space more generally. This helps us to articulate the postmodern condition in which cyberpunk emerged. The socio-historical inquiry (however rough and incomplete) forms the contextual base for our analysis of the film – of the ways in which the postmodern city is presented, and of the references to Hong Kong’s urban space as made in this presentation. The analysis then leads us to new perspectives of what geographer David B. Clarke refers to as the cinematic city – cinematic city concerning both “the relations between urban and cinematic space” and the “screenscape” that the cityscape has come to be seen as (Clarke 1997, 2). We take on the position that the cinematic city is not just a context or an image, but also a body and a ghost as it both hints at a familiar place (a ghost) that is at the same time only a projected shell or a shell that is projected on (a body only). The film portrays a search for what it means to be human. It negotiates questions of real and not real, questions that are particularly challenging when considered in the context of the postmodern city, which is a place of particular references and intertextuality – a place of spectacle where “the real” is hard to find if not long gone. This kind of city is not only postmodern in its thematics, it is postmodern in its form. It is hybrid, it is vertical, it is about façades and projections. This article articulates how the American adaptation of Masamune Shirow’s manga has produced another kind of future city via Mamoru Oshii’s visual elaborations in the 1995 anime with the same title; a future city that finds both resemblance and misconception in the everyday experience of Hong Kong as a “shell” that is, as Ackbar Abbas would refer to it, both familiar and unfamiliar (Abbas 1997). The article reiterates the exchanges between film and the city, towards a story about spectacle and the contemporary urban experience. The postmodern city and the cinematic city of cyberpunk cinema are both spectacles that are subject to and products of what Bruno (1987, 64) calls postindustrial decay. Visually, this has resulted in a recycling (perhaps even a reappropriation) of a recognisable collection of obsolete items and images from the decaying city, in its imagined or projected future. We argue that precisely in the spectacle of the postmodern city as represented in the American remake of Ghost in the Shell, it is made apparent that Hong Kong as one of the Asian cities that has inspired the urban aesthetic of cyberpunk, is both familiar (a ghost) and unfamiliar (a shell) as symbolised in the relation between the film’s main protagonist, the Major, and the city in which she operates. Cyberpunk, as a sub-genre of science fiction, has its roots in the New Wave science fiction movement of the 1960s and 1970s where writers began exploring ways to combine “the best aspects of both science fiction and mainstream literary fiction” (Higgins 2013, 2). This movement is by some (e.g. Higgins 2013; Hoppenstand 2016) described as a response to the limiting “pulp-formula” of traditional science fiction. However, elsewhere it is stated that the movement is best understood as the same genre but “revolving back upon itself to reconsider its original logic” (Roberts 2016, 377). Science fiction writer and professor Adam Roberts (2016, 377) even goes as far as suggesting that New Wave science fiction is nothing more than a way of addressing “what ‘happened’ to science fiction” in the 1960s and 1970s. What “happened” to science fiction, happened in the context of a changing world where rapid technological development did not only inspire but also induce concern about potentially destructive qualities of technology. While technology brought the first man to the moon, transformative social change and movements in support of social equality happened across the Western world – in the aftermath of World War II, in response to the Vietnam War, and with the end of colonialism, among other world-changing events (Higgins 2013, 1). Instead of excitement about the future, there was an increasing concern about the past (Roberts 2016, 336). As a decade of conservatism (the 1950s) was quickly replaced by one in which countercultures thrived (with and without psychedelics), New Wave writers were not only inspired by outer space, but also by inner space: “normative consensual reality” was opposed across the United States and Europe, and New Wave writers engaged in this development (Higgins 2013, 5). Specifically, as New Wave writers developed a critical perspective of technological development and of certain world orders, they began to imagine dystopian scenarios. Entropy and chaos were the conditions of New Wave worlds. Alfred Bester’s novels of the 1950s, however, can be taken as early examples of similar critiques. His novels specifically deal with the problem of the (white) masculine hero common in pulp novels of his time (Roberts 2016, 304). Furthermore, in film, Fritz Lang’s cinematic imagination of a dystopian future as portrayed in Metropolis (1927) is an even earlier science fiction work that came to inspire science fiction films and literature of the following decades (The Harvard Gazette, July 17, 2014). The comic, The Long Tomorrow (1975), which came out in two parts – in the French magazine Métal Hurlant (1976) and later also in its American equivalent Heavy Metal (1977) – became an important visual referent for the urban aesthetic of later science fiction worlds. It includes elements of crime noir fiction and presents a science fiction future with flying cars, dense living environments, and most of all dystopian atmospheres (Neon Dystopia, June 15, 2016). The comic has influenced the worlds of Neuromancer (1984), Blade Runner (1982), and other prominent science fiction novels and films – Star Wars (1977) included, as well as films such as The Fifth Element (1997) and Alien (1979) which the writer Dan O’Bannon and the artist Jean Giraud (a.k.a. Moebius) of The Long Tomorrow were invited to work on (Wheeler 2016). O’Bannon worked on the screenplay of Alien and Moebius on the concept design of The Fifth Element. Although critiqued for its “dumbing down” of the science fiction genre, which was initially mainly a written genre, Star Wars can be seen to have redefined visual science fiction. With Star Wars, science fiction became one of the most popular genres in visual media (Roberts 2016, 399-400). Furthermore, Tron (1982), which came out some years later (and which storyboard and production design Moebius had also worked on), provided a certain narrative and visual grammar for the presentation of cyberspace, telling a story about a hacker fighting a Master Control Program inside a computer (Roberts 2016, 399). And Blade Runner released in the same year, proposed the grubby, postindustrial urban aesthetic that has since been the accepted image of cyberpunk film. Indeed, soon after The Long Tomorrow, cyberpunk grew into a significant sub-genre of science fiction, bringing together dark views of urban life and imaginations about the dystopian potential of technological change (Abbott 2007, 124). As early as the 1980s, authors such as Neal Stephenson and William Gibson began narrating detective-like stories where hackers or self-destructive cops would fight corrupt or otherwise shady corporations in hyper-technological settings (Abbott 2007, 124). These stories present a near future that is exclusively urban and particularly hybrid – racially, spatially, bio-technologically, and aesthetically. Neuromancer in particular established the cyberpunk sub-genre as it combined the premise of Tron with the Blade Runner aesthetic (Roberts 2016, 439). Cyberpunk, however, can be seen as something more than a sub-genre. It needs to be understood as part of a much larger cultural development. It did not just develop in a context that was particularly postmodern, it partly defined this context (Roberts 2016, 440). Giuliana Bruno (1987, 63), in her argument about postmodernism as elaborated in her reading of Ridley Scott’s Blade Runner, states that postindustrial decay – which inspires the New Wave and cyberpunk aesthetic – is an imminent condition of the modern city. It is not an imagination about, but an implication of the city of the near-future. She suggests that the future city is not ultramodern by default but postmodern by consequence, leading to the adaptation of an aesthetic of decay in the cyberpunk genre. Geographer David Harvey calls this a remarkable portrayal of the conditions of postmodernity and of the complex experience of space and time (Harvey 1989, 322). Bruno (1987, 64) explains postindustrial decay as “an effect of the acceleration of the internal time of process proper to postindustrialism”. The speeding up of production has resulted in a mode of “recycling” – a reusing of obsolete things, fashion, images, the city – that has found form in the cyberpunk genre. This mode of recycling is a pastiche. There is no longer room for uniqueness (Bruno 1987, 66). Pastiche has its own logic, and can be understood as radical eclecticism. It celebrates representation in the postindustrial society – in the “society of the spectacle” of Marxist thinker Guy Debord (1983) where everything is a simulation (Bruno 1987, 67). The real is the fiction (Bruno 1987, 67). In other words, with postmodernism, the imaginary of the city as presented in cyberpunk is “the real”. The real and the simulation are no longer one or the other – the city is the simulacrum. The cyberpunk city, in Bruno’s reading, does not “conceal the truth”, it “conceals that there is [no truth]”, following a quote from Ecclesiastes in Baudrillard’s book Simulations (1983, 1). Even though cyberpunk presents a certain simulacrum – a representation only, that patches together diverse reused images, objects, cities, cultures – a note has to be made about the racial aspect of its temporally adjacent universes. With the premiere of the much-anticipated Blade Runner 2049 (2017), a discussion revived not only about cyberpunk’s fetishisation of Asian urban space, but about the systematic exclusion of Asian actors from cyberpunk films. Los Angeles in 2049 – the setting of this new Blade Runner film – is more than a Chinatown of the future. It is presented as an urban agglomeration with distinct East-Asian features; it stages the usual vertical architectural form and endless urban sprawl, decorated with neon-coloured signage in Japanese and Chinese. Korean signs appear later, when the story moves to the abandoned city of Las Vegas. Yet, in spite of this significantly hybrid urban image with East-Asian characteristics, the film’s cast is predominantly white while only a few extras seem to be of East-Asian descent. This critique of exclusion follows from recent whitewashing allegations made when actress Scarlett Johansson was selected for the role of the Major in the film of our focus – the American remake of Ghost in the Shell (e.g Los Angeles Times, March 28, 2017). Ghost in the Shell originally being a Japanese manga that was developed by Japanese comics artist Masamune Shirow, and subsequently turned into two anime films by director Mamoru Oshii who took inspiration from the Hong Kong cityscape, it has been widely argued that an Asian actress should have been given the part – not in the least place because the Major’s name in the anime series is not Mira Killian (as in Sanders’ remake), but Motoko Kusanagi. This discussion about white actors playing non-white roles, or roles in films that ought to present racially diverse urban fabrics, is highly important and very necessary. It does, however, not fit the scope of this article. We focus on the representation of urban space in Rupert Sanders’ version of Ghost in the Shell. That is, we mainly focus on screenscapes and less on the socio-cultural fabric of the cinematic city. In so doing, we address the other argument that is often made with regard to cyberpunk, namely that it fetishises Asian cityscapes. We do this by also highlighting developments in, and the importance of, Japanese science fiction and its related aesthetic form. Rupert Sanders’ Ghost in the Shell is the most recent adaptation of the infamous Japanese comic series with similar (English) titles – The Ghost in the Shell (1989), Ghost in the Shell 1.5: Human-Error Processor (1996), and Ghost in the Shell 2: Man-Machine Interface (2001) respectively. This series is created by Masamune Shirow, whom critics refer to as the master of Japanese cyberpunk (e.g. New Retro Wave, February 1, 2016; Nihonden, July 25, 2016). Japanese cyberpunk relates to Western cyberpunk but it has its own characteristics – usually with an industrial aesthetic and a challenging plotline. Shirow’s manga series – its philosophical fabric and social contemplation – also presents such a narrative. It has a depth to it that already begins with the titles. “Ghost in the Shell” directly references Hungarian-British author Arthur Koestler’s book The Ghost in the Machine (1967) which was, in turn, based on an earlier idea coined by British philosopher Gilbert Ryle as he described René Descartes’ theory of mind-body dualism (Komel 2017, 923). Shirow’s Ghost in the Shell explores existential questions about the relation between spirit and body and, in so doing, presents a layered story with a complex plotline. The American adaptation of Shirow’s Ghost in the Shell follows a model of narration that the world is more familiar with. Some critics (e.g. Mintzer 2017; The Japan Times April 12 2017) refer to it as a “sleek watered-down version”. However, produced by Paramount to be screened as a mainstream film, a simpler storyline was to be expected. Ghost in the Shell tells a story about a fight against cybercrime in the city of the near future. It follows the Major character whom is called Mira Killian in the American adaptation. She is a cyber-enhanced human (a ghost in a shell) and the first fully functioning result of a secret project by Hanka Robotics – a corporation that builds and sells cyborgs and cyber enhancement services. The corporation developed a technology with which artificial bodies (shells) could integrate human brains (ghosts). The CEO of Hanka Robotics put the Major to work on counter-terrorism operations with a bureau called Section 9. Although she has the perfect artificial body to work on such cases, she increasingly experiences glitches related to her “real” past, which should not be possible. The Section 9 team, including the Major’s loyal partner Batou, witnesses a cyber-terror attack on a conference at Hanka Robotics at the beginning of the film. After this, the Major begins chasing antagonist Kuze, the Puppet Master. Kuze is able to hack the artificial minds of cyborgs, hence his nickname. In her quest to find Kuze, the Major discovers that there had been other test subjects of Hanka Robotics’ secret project whom had all seemingly died. At the same time, she discovers that the memories she has of a past that she believed was hers, are mere implants and that the glitches she experiences are fragments of her actual past. The American adaptation has further included a storyline where the Major discovers that she has, in fact, another name – Motoko Kusanagi – and a mother whom she decides to visit. However always supported by her partner Batou, a change of events causes the Major to become the subject of a chase as her narrative is increasingly woven into that of Kuze. Whilst the narrative structure and philosophical layering of the Japanese manga (or lack thereof in the American remake) is worth investigating, what this article focuses on is the remake’s visual references – specifically, the urban imagery that defines the Ghost in the Shell universe and that makes reference to an urban landscape that has inspired much of the Japanese and Western cyberpunk genre. Indeed, Sanders’ Ghost in the Shell has not only taken reference from the initial manga. It largely borrows from the anime Ghost in the Shell that was made in 1995, some years after the first of the manga series had come out. It was Mamoru Oshii who turned to Hong Kong in his quest to finding the perfect image of the future. The anime is the first of a sequel, the second being Ghost in the Shell 2: Innocence, which was released in 2004. This sequel (Oshii 1995, 2004) is a classic in its own right which is, in turn, influenced by another cyberpunk classic, namely Ridley Scott’s Blade Runner. The latter, as alluded to earlier, is often presented as a metaphor of the postmodern condition (Bruno 1987, 62) and was indeed a source of inspiration for much of the cyberpunk movement – both in the West and in Japan (Medium, December 31, 2016). Cyberpunk cities are daunting metropolises; they are forecasts of tomorrow’s Londons, New Yorks, Tokyos – of hybridised global cities – where “hyper-communication” (Abbott 2007, 124) informs high-rise landscapes and subterranean plotlines. Indeed, many of these forecasts feature Asian (e.g. Japanese or Chinese) characteristics, specifically in the composition of the respective universes the films, novels, and comics are set in. For example, Ridley Scott’s Blade Runner, which, as mentioned above, set the tone for a novel branch of cult films (neo-noirs), features Los Angeles in 2019, as imagined with distinctively Asian characteristics: neon-lit streets, high-rises, and dense, “multicultural” urban publics. The image of Blade Runner presents a “postmodern pastiche”, as both Bruno (1987) and Wong (2000, 98) argue. Leonard Sanders (2008) attempts to explain the extensive references to the Japanese city, as made in Western cyberpunk fiction – in films such as Blade Runner or even more literally in, for example, William Gibson’s Neuromancer which is set in the Chiba Prefecture (an industrial area near Tokyo). First of all, he alludes to the Western exoticisation of Japan and to the existing admiration for Japanese aesthetics (e.g. tea ceremonies, geishas) and martial arts (e.g. judo, karate) (Sanders 2008, 29). That is, specifically in the New Wave movement, Asia was “re-signified” following the inward look of the New Wave science fiction movement and its fascination with the spiritual side of Asian culture – Star Wars’ Jedi tradition being the most obvious example (Goto-Jones 2008, 14-15). Yet, the reason for cyberpunk to be this involved with Japan has also to do with the rise of Japan as an economic force, which was specifically apparent in the 1980s and 1990s. As Goto-Jones (2008, 15) puts it, “Japan was no longer merely science fictional, Japan had become the future itself”. Sanders argues that the American (Western) imagination about Japanese urbanity can be understood as what he calls “postmodern orientalism” (Sanders 2008, ii) or “techno-orientalism” (Sanders 2008, 237). The imagination about a technologically advanced yet dystopian Japanese city is a response to the economic crises of the 1980s in the West, as well as a realisation that the world may be moving towards a “Japanese future” (Sanders 2008, 237). While Japan was no longer a military threat to the West (post-WWII), this imagination was not so much based on anxiety, but rather on a certain form of excitement. Or, as Goto-Jones (2008, 14) argues, the Western (specifically European) view of the Japanese future was informed by an earlier romantic mystery that came with the place. Besides imaginations about distinctively Japanese futurism, or Japan-inspired representations of near-future cityscapes, Hong Kong is the other place that has triggered imaginations of dystopian futures for decades. The impression of Neuromancer’s Chiba that Barclay Shaw, the illustrator of the Phantasia Press edition (1986) of William Gibson’s book, gave is not quite what a future Japanese street scene would look like. Instead, it features a fragment of an urban space that has a significant Hong Kong “feel” (Wong 2004, 98). Since, myriad Hollywood films have also taken Hong Kong as a source of inspiration for their representations of dystopia or as settings for significantly dystopian events – some recent ones being Pacific Rim (2013) and Doctor Strange (2016). At this point, it may be clear that the urban aesthetic of cyberpunk films is often informed by particularly Asian or, to be more precise, East-Asian characteristics. Yet, as Oshii’s Ghost in the Shell proves, such imaginations are not one-directional (e.g. a Western gaze onto the East). As we will elaborate in the next section, Japanese cyberpunk was also fascinated by Asian urbanity, specifically by the densely populated Chinese enclave called the Kowloon Walled City in Hong Kong, which was demolished in the early 1990s. This is to say that Japan is not only “science fictional” (i.e. inspiring Western science fiction), it has its own science fiction tradition with its heydays in the 1970s and 1980s (Goto-Jones 2008, 15). This Japanese tradition is particularly open to diverse media forms that can carry the narratives – it has embraced the “convergence culture”, Ghost in the Shell’s diverse adaptations being an example of this (Goto-Jones 2008, 15). Furthermore, in its fantasy about Hong Kong’s urbanity, Japanese cyberpunk can be seen to have adapted to another kind of Orientalist perspective (Sanders 2008, 247). More specifically, as Sanders argues, inspired by Edward Said’s (1994) view of empire, the Kowloon Walled City forms “an unparalleled (and unforgettable) example of the geography of empire and the many-sided imperial experience that created its fundamental texture” (Sanders 2008, 248). With texture, he means, both Hong Kong as the British saw it and the circumstance that allowed the enclave to emerge and sustain. The Kowloon Walled City became a site for interaction between “imperialising Europe” and the “imperialised other world” (Sanders 2008, 248). Despite there being significant differences between the kind of cyberpunk fiction that was produced in the West and in Japan in the 1980s and the 1990s (differences in plotlines, audiences, and socio-cultural movements), cyberpunk and its intertextuality could be understood as a transnational conversation under the socio-political conditions of its time. The apparent connectedness of that time, and the mediated society that it implied, invited critiques of postmodern existence and initiated questions about the meanings of relations between people and between people and machines (i.e. biotechnology). Yet, cyberpunk could also be understood as a movement that thrived on the possibility of connectedness (of being connected) that had become so apparent at the end of the twentieth century. As Fredric Jameson argued, the genre is the “supreme literary expression if not of postmodernism, then of late capitalism itself” (Jameson 1991, 419). Japan, in this story, is precisely that – a “postmodern scene, a global array of disjunctive flows” (Sanders 2008, 4). Japanese scholar and critic Takayuki Tatsumi observed that specifically in the late 1990s, both American and Japanese cultures came to new conversations not only between outlooks and belief systems, but also between “the science-fictional Japan of the American imagination and Japanese science fiction itself” (Tatsumi 2006, 176). In this conversation between Western – particularly American – culture and that of Japan, American imaginations about Japan (and Asian urbanity) interact with (and, at times, inspire) Japanese representations. Tatsumi considers this conversation to be one between Orientalist and Occidentalist views of Japanese and American cultures and aesthetics (Tatsumi 2009, 318). The mise-en-scène of Oshii’s Ghost in the Shell however suggests also another kind of orientalising. It presents a highly aesthetic interpretation of the urban spaces of Hong Kong – an interpretation that is for an important part informed by the form and circumstance of the earlier mentioned Kowloon Walled City (Image 1). The Kowloon Walled City, demolished in 1993, was a patch of urban space within the territory of Hong Kong, that was kept as a mainland Chinese enclave during Hong Kong’s colonial days. It was a notorious and hyper-dense hybrid space with its own rules; a space of anarchy where everything was possible – trade, gambling, etc. Regardless of its disappearance (or possibly partly induced by it), the Kowloon Walled City has left an “affective imprint” as it became the subject of – or inspiration for – among other cultural products, Japanese manga and anime (Fraser and Li 2017, 218). Image 1. 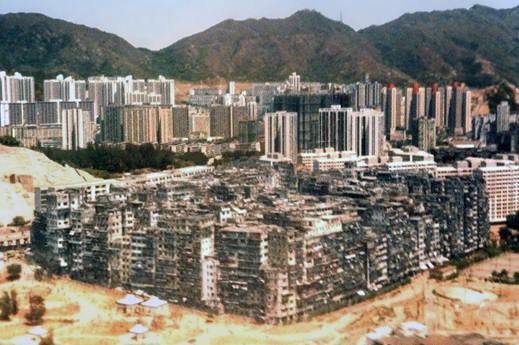 “The Kowloon Walled City” by Dan Jacobson (under CC BY-SA licensing). The Kowloon Walled City became subject to filmic exploration at a moment in history when anxiety in the context of postmodernism and late capitalism was specifically prevalent (Fraser & Li 2017, 225). It has indeed been a source of inspiration for a range of Japanese manga and anime fiction – among which, for instance, Tsubasa: Rezaboa Kuronikuru (2003-2009) and Kindaichi Case Files, Hong Kong Kowloon Treasure Murder Case (2012). The creative production and the consumption of such imaginations seems to manifest an “Orientalist fantasy” (Ng 2015, 145 in Fraser & Li 2017, 225) that is apparent in both Japanese cyberpunk fiction, and in cyberpunk as produced in America and in the West more generally. Furthermore, in light of Bruno’s (1987, 64-67) argument about postindustrial decay and the related radical eclecticism that celebrates “the society of the spectacle” (Debord 1983), it can be argued that the reproduction of the Kowloon Walled City in Japanese cyberpunk fiction is precisely the kind of recycling of otherwise obsolete urban details (rather, of urban details that have previously been rendered redundant) that produces its postmodern aesthetic. A City, a Shell, a Soul? The latest Ghost in the Shell adaptation can be understood to have come full circle – via Blade Runner, Shirow’s manga, and most importantly Oshii’s anime, which has to an extent been visually influenced by Blade Runner (2017) – in its portrayal of a future city that is both inspired by earlier cyberpunk work (that took inspiration from Hong Kong), and by Hong Kong’s cityscape as we know it today. These inspirations and interactions, further, work between Japanese and Western visions and narratives, as well as interpretations of urban settings. Where Oshii’s anime was merely inspired by Hong Kong’s urbanity and its significant architectural configuration, the American adaptation has interpreted the anime towards a blockbuster film that does more than simply reference Hong Kong. Sanders’ Ghost in the Shell “inserts” fragments of the actual city into the story of Ghost in the Shell – however not before the necessary post-productive treatment. In its search for “real” locations in Hong Kong, the adaptation can be seen to superimpose an imagined Hong Kong onto the actual cityscape. Yet, at the same time, it can also be seen to have laid images of Hong Kong’s city- and streetscapes over Oshii’s anime. As explained in Baudrillard’s (1983, 1) words, Hong Kong has become the simulacrum. As the real and the simulation are no longer binary oppositions in the context of the postmodern city, the city of the postindustrial society is a city that is a spectacle of recycled urban fragments – a spectacle that projects a city. The second scene of the film establishes this in a long shot that takes the audience along a “holographic neon-lit” cityscape that ends at the film’s Major character standing on top of a building, looking down at the city below. The city features a spectacle, a landscape of skyscrapers decorated with holographic advertisements that form a dynamic composition of blue-, green-, and red-tinted hues. Lights cast over the otherwise dark buildings. A landscape of verticality presents neon colours that match the usual impression one has (or is given) of Hong Kong’s cityscape and its patchwork of neon signs. In the distance, one building boasts a stylised five-petal Hong Kong orchid tree flower – the flower that features on Hong Kong’s flag. Certainly, this scene – with its long flyover aerial establishing shot – presents the spectacle of Hong Kong and of the film itself – giving away clues that Bruno (1987, 66) might call recycled images. The scene presents both the film and the city in which it is set as an intertextual complex: a pastiche. With the establishment of the location, the next scene addresses the possibility of cyber enhancement in humans. It features a banquet for the President of the African Federation, organised by corporation Hanka Robotics. The conversation at the banquet engages different opinions about cyber enhancement to which an important comment is made about what is “real” and pure in this context. It introduces the audience to the existential question the story of Ghost in the Shell evolves around – between soul and body – namely, “what it means to be human.” This scene is the first of many scenes in which questions of the “real” are explored in terms of human existence, however let us emphasise again that these questions are woven into the fabric of the postmodern city, the city that is in itself a copy of sorts – a patchwork of references. At the end of the scene, it is made clear that the Major character is the one struggling most with this question of soul and body, which also explains the opening scene of the film. In this scene, we see her wake up to a voice that tells her that her human body had died but that her “ghost” was saved and given a new “shell”. What is interesting about the portrayal of loneliness that seems to come with such bioengineered existence, is the aesthetic connection that is made between the Major’s being inside a cybernetic body and the urban landscape in which she operates as an agent fighting crime. The cybernetic body – the artificial body – is in a way just like (or part of) the city in the background. It is a shell – a reference to a (human) body – while the postmodern city is at the same time a reference to a city and therefore a shell. The city is a shell that is constructed through intertextual references that are, to a significant extent, digital in nature. This connection between the cybernetic body and the urban environment in which it operates is made particularly apparent in the transition from the second scene into the third. Here, the Major has realised that an attack is about to take place at the Hanka Robotics banquet. The fastest way for her to get from the top of the building to the banquet hall is by travelling through the digital spaces of the city. She dives down from the building into the data structure of the city – she becomes one with the city, her ghost is encapsulated by it. The Major exists for a short while merely in the city’s cyberspace, emerging again from a wall-length screen at the site of the attack, to help keep casualties to a minimum. The scene following the banquet attack is one of many that makes the connection between the cybernetic body and the “shell” of the city visually explicit. In this scene, the Major is back in what seems to be her room. She is resting (for as far as cyborg bodies need resting) and as the camera moves further away from her, the window above her bed emerges and allows a view of the city she lives in – an anonymous urban image featuring particular verticality. The Major is positioned in the middle of the screen – on her own – against a backdrop of the city. Indeed, the urban landscape mirrors the shell of the cybernetic body. It forms an urban shell that is seemingly soulless. Yet, it is also a familiar place and therefore potentially a place with a soul. Returning to the idea of loneliness – the kind that the Major seems to be experiencing when considering her existence as something potentially other than human – she does not seem to seek closeness to others. She does seek physical closeness to people in an attempt to understand how their bodies differ from hers. However, even the person who knows her best – her partner Batou who went through cyber enhancement himself, after he had got injured in an explosion – struggles to be close to her. His cyber enhancement involved the fixing of a new pair of eyes, which allowed him to “see like her”. Yet, the Major seems to carry the burden of the existential question of what it means to be human entirely on her own. Regardless of the implied sense of loneliness, the Major seems only “at peace” when she is truly alone; when she is away from people and data streams. She is “at peace” when she is away from the city; when she does not need to think about her own existence. In Osshi’s anime as well as in the American remake, there is one place where the Major can find this kind of quiet. She spends time under water, away from cyber noise and away from people. She makes deep dives which – as a dialogue between her and Batou in Oshii’s anime explains – make her feel anxious and lonely but hopeful as well. Specifically, in that brief moment when she comes back up, approaching the surface, she feels like she could transform into something different: a reference to a possible rebirth, or hopes thereof. Precisely this capacity to be hopeful might make the Major most human. In the absence of the city, hope for “real” existence seems to be able to exist. Once resurfaced, however, the postmodern city features again in the background. “Reality” kicks in. The simulacrum is the real. In the American remake, the postmodern city as seen from the water is most certainly a reference to the all too familiar Hong Kong skyline. In Osshi’s anime, it is a similar skyline of a similar city. The city is a simulacrum both at the level of the streets – in the urban details interpreted from the Kowloon Walled City via Osshi’s anime through to Sanders’ remake – and at the level of the skyline. Other wide-panning shots of the cityscape hint at similar ideas about the connection between city and shell and city and soul. The shots do so as the skyscrapers they capture feature building-high projections of human and cyborg figures. The “screenscape” can be understood in two ways. On the one hand, it is as though the projections on the buildings suggest that the shell of the city may be more than just a shell: a body with a soul (if not a human soul, then a “cybersoul”). On the other, it may be articulating the exact opposite, namely that everything in the city of the future is a projection: a spectacular place without a soul. At the street level, the typical chaos presents itself with illegal sellers of sorts chasing after potential buyers, advertisements flashing by, stray dogs living in alleyways. The atmosphere of these streets and the adjacent indoor spaces the streets give access to (grim nightclubs, brothels) is perhaps closest to what one would imagine the Kowloon Walled City was like. Oshii’s anime gives at a certain moment in the film a minutes-long impression of the chaos of the city from the level of the streets (which are in Oshii’s version waterways). This is one of the most remarkable scenes in the anime, however the American adaptation has not quite adapted this in the same way. What Sanders’ adaptation instead emphasises is a series of recurring bird’s-eye view shots of the city. These are shots similar to the long shot at the beginning, revealing fragments of the city’s network of roads and flyovers, surrounded by holographic advertisements projected on and between buildings. It appears that the city of Ghost in the Shell (2017) is best presented in this way – somewhere between street level and rooftops. Architects Adam Frampton, Jonathan D. Solomon, and Clara Wong came to a similar observation about Hong Kong some years ago whilst living in the city. They published a book titled Cities Without Ground: a Hong Kong Guidebook (2012) in which they present Hong Kong as existing above- and underground. They argue that Hong Kong is a city without ground as the density of its urban centres has made it necessary to build roads and pedestrian infrastructures in the air and underground. Whilst the authors map out the ways in which public and private spaces in Hong Kong are connected via networks of pedestrian walkways that lead people from shopping malls to train stations without ever needing to set foot on the ground, we prefer to interpret their claim – rather, borrow their idea – about “Hong Kong without ground” in relation to the city’s significant verticality. Life happens vertically in the city that tops the list of cities with most skyscrapers. Further, verticality speaks to everyone’s imagination just like it did to comics artists O’Bannon and Giraud when they created The Long Tomorrow (1975) or to Fritz Lang for that matter, and to his screenwriter Thea von Harbou, when they realised Metropolis (1927). Indeed, the vertical city is a pastiche. It occurred and reoccurred ever since the very first science fiction works. Cyberpunk worlds are vertical and stories play out both underground, in the air, and also on rooftops. Myriad scenes in cyberpunk films have important events happen on rooftops – Blade Runner’s infamous final scene included. Rooftops are also places for vulnerable moments. The new Blade Runner 2049 includes a love scene between replicant K and holographic avatar Joi, which plays out on a rooftop (against a backdrop of urban verticality). Further, besides the second scene of Ghost in the Shell (2017) in which the Major is scanning the city for cybercrimes, there is a rooftop scene with Batou whom is supposedly enjoying a beer on a quiet night, accompanied by a street dog that he has befriended. Chow and De Kloet (2013, 140) in their reading of rooftops in Hong Kong films, argue that in the vertical city of Hong Kong rooftops are places where characters come to terms with themselves and with the urban space in which they find themselves. Drawing from Lindner (2011), they further suggest that alienation and detachment are far more severely experienced in big metropolises. Rooftops, then, are places that “connect the materiality of global capitalism with embeddedness in a local environment” (Chow and De Kloet 2013, 142-143). Transferring this idea to the cyberpunk city and to the Major on top of that building, she is quite literally connecting with both the materiality as well as the local environment of the city below. Batou, on his rooftop, projects an entirely different experience of “connecting” as he is both in touch with the materiality of the postmodern city (the physical rooftop) and connected with the stray dog from the alley – the local environment. Verticality gives a city a body (a shell). It provides an urban shell for projection. Yet, it also allows a city a soul – on rooftops or in moments of human interaction. In other words, it allows spaces for encounters, such as on rooftops – encounters that do not need to be violent. Rooftops allow distance and connection. They allow a special kind of vantage point where one can be both in the city and looking at it. They provide perspectives of spectacles and inner selves: reflection. “You’re what everyone will become one day”, this is what the Major is told in a moment of doubt. The first of her kind (at least that is what she has been told), the Major is a success story of biotechnology – an operative ghost inside a shell. If the cybernetic body, the shell, is like the city. And if the intention is indeed to reproduce this body and the related technology, i.e. “You’re what everyone will become one day”, then the body and the city are both the simulacrum. There is no original. We have elaborated an inquiry into imaginations and images of Hong Kong as a cinematic city in the context of cyberpunk film – a postmodern city which spectacular visuality is repeatedly re-presented in cyberpunk cinema and specifically in Sanders’ Ghost in the Shell. In this film of our focus, the city is not just a representation of urban fragments or – in Bruno’s words – recycled images. Instead, it is reframed as “a body with a ghost” as it is connected to the Major’s quest to finding meaning to her being or not being human. In cyberpunk film, the city is reframed as a shell patched with lights and shadows – with intertextual references, recycled meanings – encapsulating the soul (or what is left of it) of a place. David Clarke (1997) suggests that cinematic representation influences how a city is understood in the minds of people. Certainly, Hong Kong comes with a certain aesthetic meaning that film (specifically cyberpunk film) has attached to it. The new adaptation of Ghost in the Shell only confirms this, precisely because it has both taken inspiration from previous imaginings of Hong Kong and from the city itself. If the Major is what everyone will become one day – a ghost in a shell – Hong Kong may be approached in a similar way. Hong Kong is the dystopian film of the future – it has long become a cinematic city, a simulacrum – a screenscape. The future city then finds both resemblance and misconception in the everyday experience of Hong Kong as a “shell” that is both familiar and unfamiliar (Abbas 1997). Ghost in the Shell is a story about spectacle and contemporary urban experience. Its latest adaptation has proven more than any other cyberpunk film that there is both recognition and distance, anxiety and resemblance, spectacle and little moments of loneliness: the city as simulacrum still beholds some elements of familiarity in experience. Precisely in, or due to, the spectacle of the postmodern city, Hong Kong as one of the Asian cities cyberpunk film has taken reference from, is both familiar (a ghost) and unfamiliar (a shell). Hong Kong is familiar and unfamiliar in its spectacle of verticality and neon-lit façades, in its significant decay, in its concern with the real, in its use of rooftops, and in its lack of ground. Rather, the postmodern city in Sanders’ remake of Ghost in the Shell can be recognised as Hong Kong precisely because of the elements of spectacle and their relation to those little moments when the spectacle exists at a distance – when we as an audience “see” the Major; when we tend to see something more than just a façade – a ghost (soul). All links verified 20 May 2018. The Fifth Element. Directed and written by: Luc Besson, starring: Bruce Willis, Gary Oldman, Milla Jovovich. Hollywood, CA: Gaumont, 1997. 126 min. Doctor Strange. Directed by: Scott Derrickson, written by: Jon Spaihts, Scott Derrickson, C. Robert Cargill, starring: Benedict Cumberbatch, Chiwetel Ejiofor, Rachel McAdams. Hollywood, CA: Walt Disney Studios, 2016. 115 min. Metropolis. Directed by: Fritz Lang, written by: Thea von Harbou, starring: Gustav Frölich, Alfred Abel, Brigitte Helm. Germany: Ufa, 1927. 153 min. Tron. Directed by: Steven Lisberger, written by: Steven Lisberger and Bonnie MacBird, starring: Jeff Bridges, Bruce Boxleitner, David Warner. Hollywood: Walt Disney Pictures, 1982. 96 min. Star Wars: Episode IV – A New Hope. Directed and written by: George Lucas, starring: Mark Hamil, Harrison Ford, Carry Fisher. Hollywood: Lucasfilm Ltd., 1977. 121 min. Ghost in the Shell. Directed by: Mamoru Oshii, written by: Kazunori Itō, starring the voices of: Atsuko Tanaka, Akio Ōtsuka, Iemasa Kayumi. Japan: Shochiku, 1996. 82 min. Ghost in the Shell 2: Innocence. Directed and written by: Mamoru Oshii, starring the voices of: Atsuko Tanaka, Akio Ōtsuka. Japan: Manga Entertainment, 2004. 98 min. Ghost in the Shell. Directed by: Rupert Sanders, written by: Jamie Moss, William Wheeler, Ehren Kruger, starring: Scarlett Johansson, Takeshi Kitano, Michael Pitt. Hollywood: Paramount, 2017. 106 min. Alien. Directed by: Ridley Scott, written by: Dan O’Bannon, starring: Sigourney Weaver, Tom Skerritt, Veronica Carwright. Hollywood: Brandywine Productions, 1979. 117 min. Blade Runner. Directed by: Ridley Scott, written by: Hampton Fancher and David Peoples, starring: Harrison Ford, Rutger Hauer, Mary Sean Young. Hollywood: Warner Brothers, 1982. 117 min. Tokyo Drifter. Directed by: Seijun Suzuki, written by: Yasunori Kawauchi, starring: Tetsuya Watari, Chieko Matsubara, Hideaki Nitani. Japan: Nikkatsu, 1966. 83 min. Pacific Rim. Directed by: Guillermo del Toro, written by: Travis Beacham, Guillermo del Toro, starring: Charlie Hunnam, Idris Elba, Rinko Kikuchi. Hollywood: Legendary Pictures, 2013. 132 min. Tetsuo: The Iron Man. Directed and written by: Shinya Tsukamoto, starring: Tomorowo Taguchi, Kei Fujiwara, Shinya Tsukamoto. Japan: Kaujyu Theatres, 1989. 67 min. Blade Runner 2049. Directed by: Denis Villeneuve, written by: Hampton Fancher and Michael Green, starring: Ryan Gosling, Harrison Ford, Ana de Armas. Hollywood: Alcon Entertainment, Columbia Pictures, Bud Yorkin Productions, Torridon Films, 2017. 163 min. Otomo, Katsurhiro. 1984-1993. Akira. 6 Volumes. Tokyo: Ködansha. O’Bannon, Dan and Jean Giraud. 1976. “The Long Tomorrow,” Métal Hurlant. Les Humanoïdes Associés. O’Bannon, Dan and Jean Giraud. 1977. “The Long Tomorrow,” Heavy Metal 1 (4): 80-87. HM Communications, Inc.
O’Bannon, Dan and Jean Giraud. 1977. “The Long Tomorrow: Part 2,” Heavy Metal 1 (4): 65–72. HM Communications, Inc.
Mintzer, Jordan. 2017. “‘Ghost in the Shell’: Film Review,” The Hollywood Reporter, http://www.hollywoodreporter.com/review/ghost-shell-review-987891. The Japan Times, April 12, 2017. “Hollywood’s ‘Ghost in the Shell’ Remake Misses the Mark,” https://www.japantimes.co.jp/culture/2017/04/12/films/film-reviews/hollywoods-ghost-shell-remake-misses-mark/ – .WsDB_2aPAWp. New Retro Wave, February 1, 2016. “Remember This…Retro Cyberpunk #2 (The Anime Edition),” https://newretrowave.com/2016/02/01/remember-this-retro-cyberpunk-2-the-anime-edition/. Los Angeles Times, March 28, 2017. “The original ‘Ghost in the Shell’ was a watershed film in animation history,” http://www.latimes.com/entertainment/movies/la-et-mn-ghost-in-the-shell-history-20170328-story.html. The Harvard Gazette, July 17, 2014. “Tracking Fritz Lang,” https://news.harvard.edu/gazette/story/2014/07/tracking-fritz-lang/. Nihonden, July 25, 2016. “Masamune Shirow: The Master of Cyberpunk, His Rise and Fall,” http://nihonden.com/anime/masamune-shirow. Neon Dystopia, June 15, 2016. “The Legacy of the Long Tomorrow,” https://www.neondystopia.com/cyberpunk-books-fiction/the-legacy-of-the-long-tomorrow/. Medium, December 31, 2016. “Case Study: Hong Kong’s Influence on Blade Runner, Ghost in the Shell, and Cyberpunk Cinema,” https://medium.com/@ray.zhu/bridging-the-gap-sci-fi-cinema-and-depictions-of-hong-kong-sar-b15800678c29. Abbott, Carl. 2007. “Cyberpunk Cities: Science Fiction Meets Urban Theory,” Journal of Planning Education and Research 27 (1): 122–131. Sage Publishing. Baudrillard, Jean. 1983. Simulations. USA: Semiotext(e). Brown, Steven T. 2010. Tokyo Cyberpunk: Posthumanism in Japanese Visual Culture. New York: Palgrave MacMillan. Bruno, Giuliana. 1987. “Ramble City: Postmodernism and Blade Runner,” October 41: 61-74. MIT Press. Chow, Yiu Fai and Jeroen de Kloet. 2013. “Flânerie and Acrophilia in the Postmetropolis: Rooftops in Hong Kong Cinema,” Journal of Chinese Cinemas 7 (2): 139–155. Taylor & Francis. Clarke, David. 1997. “Introduction: Previewing the Cinematic City.” In The Cinematic City, edited by David Clarke, 1–18. London: Routledge. Davis, Darrell William. 2010. “Technology and (Chinese) Ethnicity.” In Cinema at the City’s Edge: Film and Urban Networks in East Asia, edited by Yomi Braester and James Tweedie, 137–150. Hong Kong: Hong Kong University Press. Debord, Guy. 1983. The Society of the Spectacle. Detroit: Black & Red. Desser, David. 2003. “Consuming Asia: Chinese and Japanese Popular Culture and the American Imaginary.” In Multiple Modernities: Cinemas and Popular Media in Transcultural East Asia, edited by Jenny Kwok Wah Lau, 190–191. Philadelphia: Temple University Press. Doel, Marcus and David Clarke. 1997. “From Ramble City to the Screening of the Eye: Blade Runner, Death and Symbolic Exchange,” In The Cinematic City, edited by David Clarke, 140–175. London: Routledge. Frampton, Adam, Jonathan D. Solomon, and Clara Wong. 2012. Cities Without Ground: a Hong Kong Guidebook. Singapore: Oro. Fraser, Alistar and Eva Cheuk-Yin Li. 2017. “The Second Life of Kowloon Walled City: Crime, Media and Cultural Memory,” Crime Media Culture 13 (2): 217–234. Sage Publications. Goto-Jones, Chris. 2008. “From Science Fictional Japan to Japanese Science Fiction,” IIAS Newsletter 47: 14–15. International Institute for Asian Studies. Harvey, David. 1989. The Condition of Postmodernity: An Enquiry into the Origins of Cultural Change. Cambridge: Blackwell Publishers. Higgins, David. “New Wave Science Fiction,” A Virtual Introduction to Science Fiction, edited by Lars Schmeink, accessed September 18, 2017, http://virtual-sf.com/?page_id=321: 1–12. Hoppenstand, Gary. 2016. “Genres and Formulas in Popular Literature,” In A Companion to Popular Culture, edited by Gary Burns, 101–122. Chichesterz: Wiley-Blackwell. King, Anthony. 1990. Global Cities. London: Routledge. Komel, Mirt. 2016. “The Ghost Outside its Shell: Revisiting the Philosophy of Ghost in the Shell,” Teorija in Praksa 53: 920–928. Faculty of Social Sciences, University of Ljubljana. Lindner, Christoph. 2011. “The Postmetropolis and Mental Life: Wong Kar-Wai’s Cinematic Hong Kong.” In The New Blackwell Companion to the City, edited by Gary Bridge and Sophie Watsons, 327–336. Oxford: Blackwell. Roberts, Adam. 2016. The History of Science Fiction. London: Palgrave Macmillan. Sanders, Leonard Patrick. 2008. “Postmodern Orientalism: William Gibson, Cyberpunk and Japan.” PhD diss., Massey University. Tatsumi, Takayuki. 2009. “Waiting for Godzilla: Toward a Globalist Theme Park.” In American Studies: An Anthology, edited by Janice A. Radway, Kevin K. Gaines, Barry Shank and Penny Von Eschen, 315–318. Chichesterz: Wiley-Blackwell. Tatsumi, Takayuki. 2006. Full Metal Apache: Between Cyberpunk Japan and Avant-Pop America. Durham: Duke University Press. Wong, Kin Yuen. 2000. “On the Edge of Spaces: Blade Runner, Ghost in the Shell, and Hong Kong’s Cityscape,” Science Fiction Studies 27 (1): 1–21. Ackbar Abbas (1997: 78) argues that “changing cities produce many sights that are unfamiliar”. Taking on a visual perspective of changing cities, however, he sees also an “unfamiliar in the familiar”; an unfamiliar that quickly becomes familiar due to a continuous replay of imagery of the city. Abbas calls this situation a déjà disparu (not a déjà vu) where the “televisual” seems to overtake all other ways in which we might formerly have been able to look at the city. We take this line of thought to connect to what we will later address, following Bruno (1989), as the pastiche of the postindustrial city–a spectacle of recycled fragments. Also British actor Lennie James–an actor with African-Trinidadian roots–and Somali-American actor Barkhad Abdi make an appearances in the film, playing secondary parts. There have been more interpretations of the manga, among which two TV series and video games. “Multicultural” however with a noticeable choice for white (male) characters. Also earlier on in the 20th Century had Japan been an inspiring and somehow mystical place that was represented in Western fiction (Goto-Jones 2018, 14). The image appears neon-lit in that diverse neon colours cast their hues over surrounding buildings, yet neon technology has been replaced with a digital variant which makes a clear reference to Ridley Scott’s Blade Runner (1982). Where the manga and the anime have presented this question in a much more complex manner, the American adaptation of the story has set the tone for simplicity right at the start of the film. We do not want to project any opinions about this in our article. For a critique of the film’s plotline, we refer you to the many film reviews that can be found online.